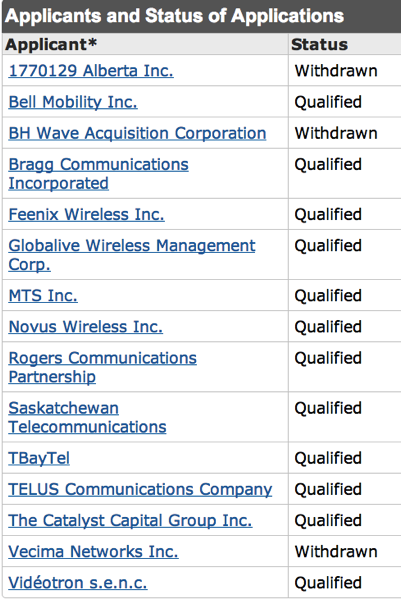 As per its 700MHz spectrum auction timeline, Industry Canada revealed the final list of qualified bidders yesterday, which has a dozen final candidates remaining after three have withdrawn from the original list revealed back in late September. A mock auction will commence on November 27 for these bidders, to prepare them for the auction start, set for January 14, 2014, with winners to be publicized five days after the end of bidding. The 700MHz spectrum has been described as “beachfront” property due to its capabilities to extend wireless coverage, such as being able to easier penetrate buildings to provide signals.